The “Penitent Thief”, also known as the Thief on the Cross or the Good Thief, is the unnamed character mentioned in the Gospel of Luke. He was crucified alongside Jesus and asked Jesus to remember him, when he came into his kingdom, unlike his companion the Impenitent Thief. He is traditionally referred to as St. Dismas. The two men were crucified at the same time as Jesus, one on his right hand, and one on his left. St. Thomas Aquinas comments that, “The words of the Lord must therefore be understood not of an earthly paradise, but of that spiritual paradise in which all may be, who are in the enjoyment of the Divine glory. So one could say, the thief went up with Christ to heaven that he might be with Christ. St. Augustine of Hippo wondered if the good thief might not have been baptized at some point. According to tradition, the Good Thief was crucified to Jesus’ right hand and the other thief was crucified to his left. For this reason, depictions of the crucifixion often show Jesus’ head inclined to his right, showing the acceptance of the Good Thief. The Good Thief’s conversion is given as an example of the necessary steps one must take to arrive at Salvation through Christ; awareness of personal sin, repentance of sin, acceptance of Christ and salvation’s promise of eternal life. The Catholic Church never formally canonized St. Dismas, though he is regarded as a saint by virtue of Jesus saying he would be in Paradise, and by local Church traditions. 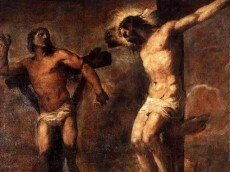 The feast of St. Dismas is venerated on the 25th of March. There are a number of towns named after him, one being San Dismas, California. There is St. Dismas Church in Waukegan, Illinois as well. St. Dismas was the “Good Thief” that was crucified at the right hand side of Jesus. He asked Jesus to remember him, and Jesus told him that he would be in Paradise with him that very day. The repentance of this Good Thief shows us the importance of the necessary steps we must take to arrive at salvation through Christ. It shows we need awareness of our sin, repentance of that sin, and acceptance of Christ and His salvation for eternal life.